River cruises cater to today’s foodie culture by offering more diverse dining options, and we’re seeing more notable chef influences. Al fresco Dining on the AmaVida. Why do you travel? People travel for many reasons: To experience a foreign culture and the thrill of adventure, to enjoy the freedom to break away from the creature comforts of home, or to shift ideas and gain new perspective. Or maybe it’s because you just need a break! When you start to plan for a trip, how you travel is as much of a consideration as where you travel, and as today’s globetrotter seeks out experiences that offer something more, river cruises are stepping up to the plate by offering amenities that are just a little different to serve up the trip of a lifetime. 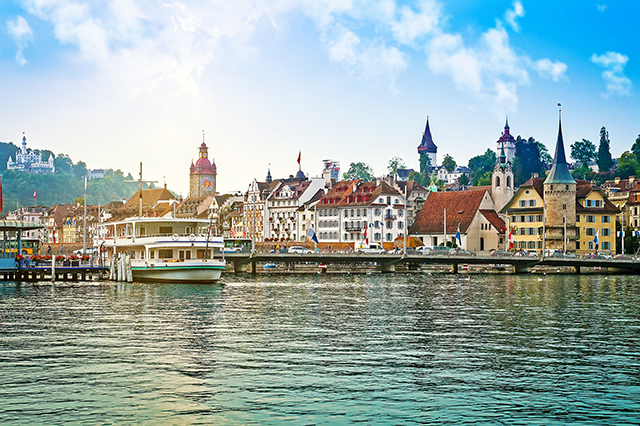 River cruise vacations are hardly a new concept, and can be a great way to explore a region in a more off-the-grid manner; foregoing the hoopla of trains, planes and automobiles in favor of a majestic boat leisurely making its way from one destination to another. 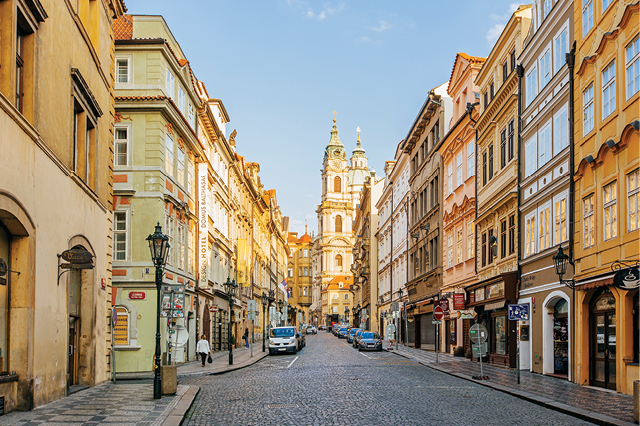 Further, as eating well and eating local become more of a priority for tourists, and as food-themed or food- focused vacation packages gain popularity, tour companies look for creative ways to meet demand. In particular, river cruises are catering to today’s foodie culture by offering more diverse dining options, and more and more we’re seeing notable chefs with restaurants lending their influence to river cruise dining. Good food is no longer only available to those that seek it out. Nor should it be! In an effort to cater to more adventurous or eclectic palates, river cruises are expanding their options to offer more variety and adding more occasion to mealtimes with sit-down formats in a restaurant-style seating rather than long lines and forced seating arrangements. For example, AMAWaterways’ Concerto-class ships offer everything from casual dining to the most personalized gastronomic experience at Erlebnis Chef’s Table, where diners can get a one-on-one with the chef. 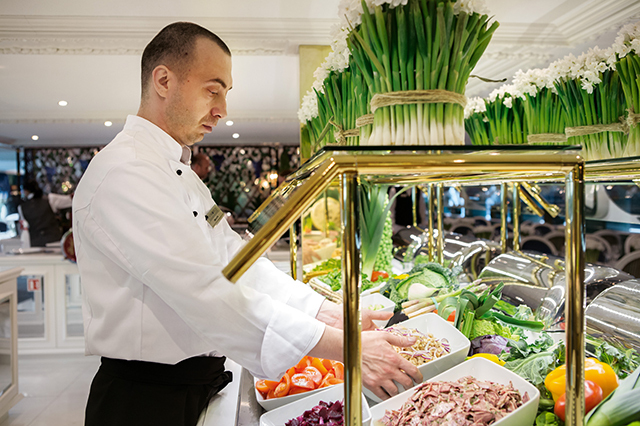 Taking advantage of their smaller size and more intimate setting when compared to ocean liners, river cruises are more flexible to accommodate food allergies and dietary restrictions, both of which vacationers are demanding more and more. 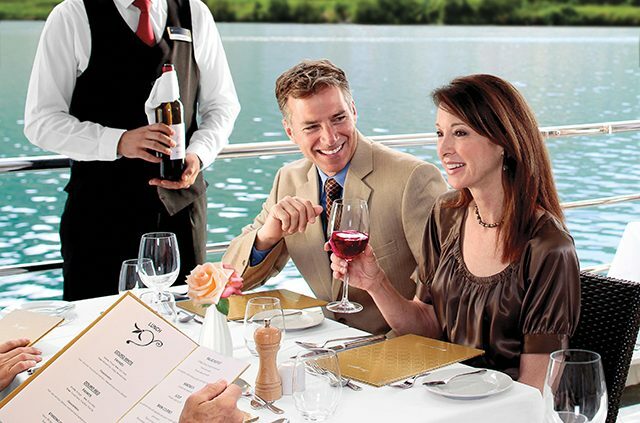 Finally, with most river cruises being all-inclusive, diners can sample more options without worrying about hidden or added expense. Farm to table? Try farm to ship! Any chef worth his or her salt knows that the freshest ingredients elevate cuisine to the highest level. Shopping locally not only allows chefs to craft meals to reflect a destination, but also to pay homage to the exciting food cultures of an area. As you meander down river from one town to another, chefs may also tailor the cuisine of a river cruise restaurant to highlight the subtle changes in regional cuisine. Adventures by Disney (in partnership with AMAWaterways) will have you sampling Swiss cheese, French wine, German pretzels, sausage and more over 8 days as the AMAKristina makes its way down the Rhine. Having local flavors readily available aboard encourages diners to try new things and to more fully embrace the culture of an area, whether it be smoked salmon and Dungeness crab aboard the American Steamboat Company’s American Empress in the Pacific Northwest to traditional goulash, bratwurst while cruising the AMA Reina down the Danube. Themed dinners are also available on some ships; should you find yourself on Uniworld’s Century Legend, enjoy some rice wine alongside a Tang Dynasty themed-dinner in Beijing. While everyone likes good food, some people really like good food! Food-centric vacationers may want a more immersive food experience, and river cruises can use the occasion to have its chefs tailor a menu and experience for you! If you like to cook just as much as you like to eat, head to La Cave du Vin on Uniworld’s S.S.Joie de Vivre and make a seven course meal yourself (under the direction of one of their master chefs, of course) complete with wine pairings. Or, head off the boat to a local’s house for dinner through their EatWith partnership. If you really feel like mixing it up, Viking’s The Kitchen Table allows you to do both: cook on sea days, and shop for ingredients on port days. Whatever you choose, activities make it enjoyable to bond with your fellow foodies, because it’s more fun to take picture of your food when you know all your table mates are doing the same thing! No need to run off the ship in search of fine dining; first class cuisine is second nature on ships these days. AmaWaterways was inducted into La Confrérie de la Chaîne des Rôtisseurs, and Chef Primus Perchtold, winner of three gold medals at the European Championship of Culinary Art, oversees its menus. Uniworld received honorable mention in the 2015 Saveur Good Taste awards when pitted against its larger, ocean liner-cousins, and its menus include highlights from noted Chef Bea Tollman’s repertoire (can you say honeycomb ice cream?). From sunrise to sunset, cruising already provides an experience unlike any other. Winding through rivers wide and narrow, taking in the natural beauty and history of a region as you sail down some of the world’s greatest rivers, river cruise vacations can transport you far away in mind, body, spirit and now, with an attention to dining – stomach! 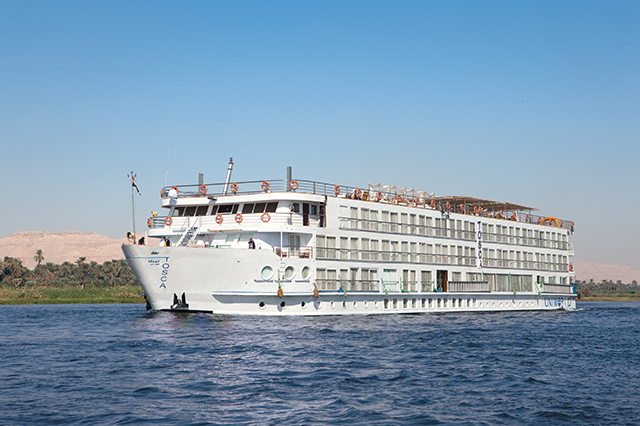 Would specialty restaurants make you more or less inclined to take a river cruise? If you’ve been on one, did you wish the dining was more authentic? Tell us in the comments. Book your next river cruise vacation with AAA. 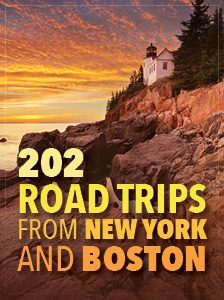 Article tags: AAA, all inclusive, automobiles, casual dining, cruise vacations, cruises, cruising, cuisine, dining options, dinner, disney, fine dining, food, home, house, lending, menu, restaurants, river cruise vacations, river cruises, travel, trip, vacation, vacation packages.